The Farmer is away and the farm has been overrun by an army of hungry foxes. 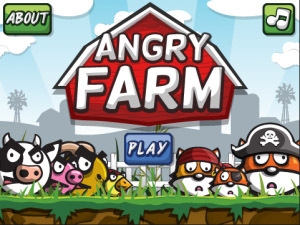 Help the angry animals fight back to clear the farm of marauding foxes. The angry animals are armed with a catapult and they fly through the air like furious birds before colliding spectacularly with the foxes who are hiding inside protective farm structures. Each of the angry animals have special properties that you can control to defeat the foxes. Angry goat flies through the air slamming into foxes and causing hay bales and wooden farm structures to explode. Angry pig bounces like a super ball of furious rubberized pork demolishing foxes and their hiding places. Angry cow flies through the air and accelerates to attacking speed when you click the trackpad or touchscreen while the angry cow is in flight. Angry hen is a bird full of bad bird attitude. So full of bad bird attitude that angry hen splits into three angry bird projectiles when you click the trackpad or touchscreen while the angry hen is in the air. To be sure that this app works great on your BlackBerry®, you can try it free using the Angry Farm Free Trial version. We hope that you enjoy playing Angry Farm and we welcome your feedback for improving Angry Farm. If you like Angry Farm, please write a great review. It will help us to keep improving Angry Farm for BlackBerry®! If you have any problems starting the app, please visit http://support.smarter-apps.com/home and we will assist you getting setup. *Please Note: The sound has been disabled for many CDMA devices. We are working hard to try and fix the problem as soon as possible. We do apologize and hope to resolve the problem promptly.